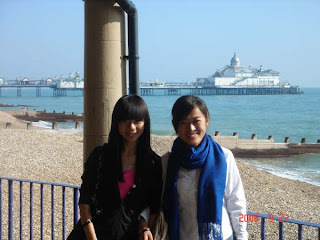 My name is Lynn and I joined in to the Twin English School Eastbourne --- the big family since 13th September, 2008. This was the long trip for me because, it is the first time which I go abroad by myself. Before I arrived here, I was worried about it, whether I could adapt to the strange environment, but when I arrived here, I was addicted to the scene of Eastbourne. It is much different from China. My host family told me that usually Eastbourne always raining in October, surprisingly it still have sunshine in this month. And I think it is the best present for me, isn't it? In the weekend, I went to the seaside with my friends , in my eyes , it was a blue world. The blue sea and the sky. It is very beautiful. We enjoyed sunshine and had a good time. On our way home, we lost our way and we asked a stranger for directions, she was vary kind and took us to our way. We felt very warm in this strange place. If you walk in the road, and some stranger pass you, they will smile with you, so I felt Eastbourne people are very friendly and kind. Not only the good environment but also the good people. The most important thing for me is that I can make many other friends all around the world. We have the same objective and study hard together. We talk with each other in English to learn each others different cultures. We all enjoy it. Eastbourne is a memorable place in my mind. Maybe after many years, I will return to here, and find my unforgettable memory.